Saturday morning and the sun is shining after a week of terrible weather. 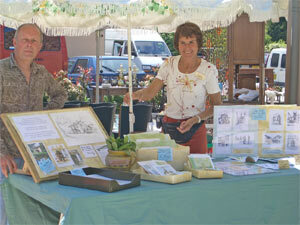 That was good news for all the stall holders at the Vide Grenier in Masseube. We trawled the assorted tables, blankets and car boots weighted down with junk. With a lot more restraint than the last two occasions, we came home with some old picture frames and a bread board. That afternoon, we visited Liselotte, a Swedish woman who is starting a Chambre d'hôtes in Marciac. (We had met her at a meeting of a bartering society, where members do things for each other in exchange for points instead of money). She asked Perry to come and photograph and draw her house for her business cards. In return, Perry arranged with her to display his work on her walls, once she opens her doors (and once Perry has enough work to show!). Sunday, and Caroline's parents are off to Spain and Portugal for a month. They'll be passing through Gers on the way home to celebrate their 40th wedding anniversary at the beginning of June. In the meantime, we went to the Office de Tourisme to see if we could set up drawing classes during the jazz festival in August. They were not too enthusiastic, since a similar venture flopped completely last year, but they invited Perry to take a stall at the summer evening art market by the lake during July and August. Monday. Off to Monties, an hours drive to the east. One of our the "32" ad responses had a house for sale for €135,000. We made a rendezvous at the crossroads near the church (one of many of our rather suspicious looking meetings in the middle of nowhere) and followed the man to a small, run down, one-floor house with a large barn. He had lit the fireplace for the occasion. It was like a time capsule inside, just as if the inhabitants had left it fifty years ago and never returned. The doorways were 1,6 metres high, the ceilings not much more. He became very emotional as he showed the room where he was born, his grandmother's identity card witnessing the tears from the mantlepiece. 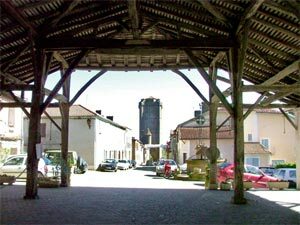 That afternoon we visited the Mairie in Miélan to find out what we needed for a Carte de Séjour (residents permit /verblijfsvergunning). We were presented with a list. Passports, wedding license, etc, etc. On the way down the stairs, we bumped into the Major and a colleague. He introduced himself and welcomed us, saying that the area needed people like us (i.e. foreigners with money). Always good for a sponsorship when Perry comes out with his Miélan postcard selection! We decided to bite the bullet and arranged a place for a stand at the upcoming brocante in Tillac. We then visited a printer in Miélan (sheer chance to have a printer so close by) to get a quote for printing postcards that we hope to sell on the market. That evening we watched dutch TV with Nieke and realised that we are missing nothing. Tuesday. To the Mairie, to discover that according to the EU/Brussels, we don't need a Carte de Séjour anymore. Very good news indeed, saves a lot of hassle and money. Perry OK'd a quote from the printer and made one more drawing to complete the set, ready to deliver the artwork the next morning. Wednesday. We raided Nieke's house for material to make our stand at the market. She came up trumps. We used an old door as a table, a bedspread as cover and a few shoe boxes to hold the postcards. Perry delivered the artwork to the printer and Caroline did some PR by sending postcards to all our contacts in the area to get them to come along on the big day. 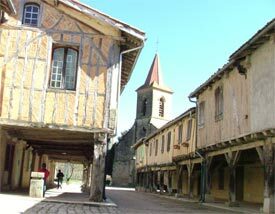 After lunch, we went to see a 300 year old monastery in Belloc, south of Mirande. It was yet another rendezvous at an anonymous crossroads, this time with the estate agent. They wanted €160,000 for a ruin. In one of the rooms we found a library of damp, rodent eaten books. Some dating from the early 1800s. The house wasn't worth half the price, so I didn't waste any film. Bassoues. A fortified market village. 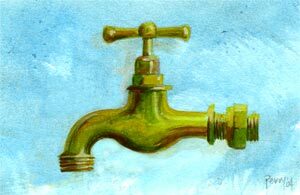 Ce ci n'est pas une tap. Saturday. Our friends Max and Addie (she is Dutch, he is French) had been in contact with Pierre, an old friend of Max, who knew of five houses for us to see. 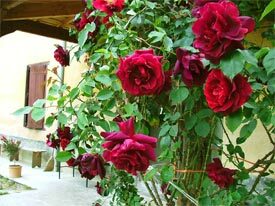 He took us to three places near Castelnau Manoac that were not interesting. The fourth, we had to look at from a distance, since the owner had decided the evening before that he didn't want to sell after all. A shame, it looked great, stood out on a peninsular with 360 degree views. 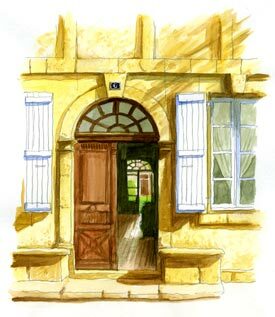 The last house was a Maison de Maître (i.e. a square building with 4 rooms on both the ground and first floor). The owner had a deal (long term lease) with a local farmer who worked the land around the house and it looked as if it was going to be hard work to buy that land. The price was also far too high, but perhaps if we make him a deal...? Later, we saw The Kenny Werner Trio and Gary Bartz at the Jazz in Marciac evening. The trio were fantastic, but Mr Bartz looked and sounded as if he had been on the local juice all day. 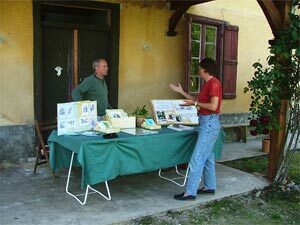 Next to us sat Jamie and Suzie, an English couple that have been running painting holidays near Marciac for the last nine years. Small world. On Sunday morning, we joined Barbara at a Biological Farm Open Day in Soublecause, near Plaisance. On the way, we visited another house for sale. The garden was obviously the owner's pride and joy. Her house was a pig sty. No thanks. We were invited by friends for lunch in Bassoues. A well known local restaurant, it was in full flow on the terrace and the two floors, with a menu for €12. Delicious. That afternoon we made passpartouts for Perry's prints and chopped wood for the bonfire. On Monday, Perry drew and painted several miniatures for the postcards and Caroline painted passpartouts. It was warm enough to eat outside by the campfire. As the sun set we heard a nightingale loosening up for a marathon singsong. He was still at it when we woke the next morning. We had a more rude awakening when Caroline very calmly informed me that her side of the bed was full of ants. A great swarm were coming through the wal,l so we sprayed with Raid and opened all the windows and doors for the day. 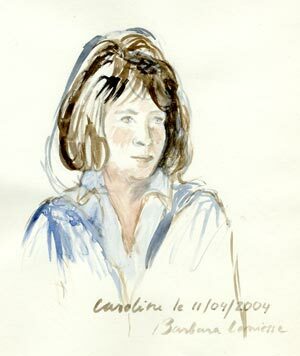 Caroline joined Perry at the drawing group that morning and was immediately enrolled as model. Barbara and the girls making the most of a willing victim. Wednesday. Off to Tarbes to find plastic bags and envelopes for the sets of cards. It was a shock to be in a city again. Traffic, music, construction, fumes. It was a joy to get away. Picked up the postcards from the printer (4000 of them) and returned home to start packing them into sets of four, under a thunderous sky. Thursday. Three days to go to the market and Perry started making paintings of vases, jars and anything else that came to hand. The rain stopped and Caroline was wrapping like crazy between bouts of sunbathing. Friday, we had a house to see. We had answered an ad in the free newspaper. €99,000 was the price. It was near Auriébat, on top of the hill. Great view, nice surroundings, but it was too small, there was a ton of work to do and the neighbour was right in front. "Thank you for your paintings. And now, over to Tony Hart..." Two Can Teamwork in full flow. "I bought this parrot in this very boutique, not 'alf an hour ago and when I got it 'ome I found that the only reason it was still on it's perch was because it had been nailed there. etc, etc. " Saturday. Last-minute scanning, printing, cutting and sticking for Perry, as Nieke and Caroline did a dress rehearsal with the stand. Price stickers, presentation boxes, an ad for Perry's services as drawer/painter of houses etc., and our own house-hunting ad. After practising some 'difficult customer' scenarios we were ready for a stiff drink, dinner al fresco and an early night. Sunday, 06:30 alarm call, prepared the packed lunch and made the five minute drive down the hill to Tillac with the old door hanging out the back. We arrived to find the market place seething with the professional stall holders already done with their deals, finishing off their stands and waiting for the public. By 08:30 we were set up for business, excited to be taking part in our first market, only two months after having arrived in France. In fact, neither of us had ever done anything like this before. At 10:15 we made our first sale, to Addie, bless her cotton socks. Two sets of Tillac postcards! €10, thank you very much. Quite a few friends and contacts passed by and some even bought a card or two. Around 1pm the place went dead. Perry wandered through the market and discovered that everyone, including the stallholders, had stopped for an extensive lunch in the shade. Barbeques, tables, chairs, wine and elaborate salads appeared from nowhere. We opened our rather calvanistic looking blue cheese dip and munched on our carrots and celery until the second wave, around 2:30pm. By 5pm we had had enough. Home for a barby and a well deserved glass or two of white wine. In total, we had made €135. Not bad for a first attempt. Monday, we were invited to Fran's house in Marciac for coffee. She and her husband Bill are retired, Scottish and very funny. Their stories, which are always against themselves, have us rolling with laughter. Today, Fran's sister, Bobby, was present, so the childhood tales were coming thick and fast. Fran commisioned Perry to make a drawing of her garden. Marvelous. Tuesday. Perry joined the drawing club in the dappled shadow of the trees at Café Maccintosh and came home filthy, from changing the wheel on one of the ladies' cars. That afternoon we went to visit Henk and Laura, a dutch couple we met at the market in Tillac. They had bought a whole collection of cards and invited us for drinks and a look at their neighbour's house. They have a fantastic cottage in a quiet valley. Stylishly, simple interior and a great source for ideas for when we finally find our house. The neighbour's house was far too big for us, but the wine went down well! Wednesday. Perry went off to Marciac to show Liselotte her business cards. She loved the design and bought the original watercolour. On to the Café de l'Hôtel de Ville, where he arranged with Eric and Bernard to sell his postcards of Marciac in the bar for €1 each. Thursday morning we were up early to go to an 'Exposition Canin' in Tarbes. Caroline had a great time identifying the different breeds and Perry fell in love with the English Setters. Friday, we framed the drawings for the exhibition in Mirande and sent letters and cards to our friends who are not connected to the web. 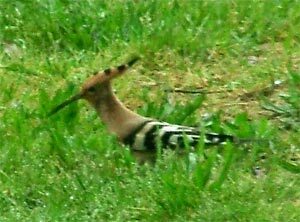 A Hoopoe! Just flown in from Africa. Stick another frog's leg on the barby, mate! On Saturday, we had an appointment with a Monsieur Bruso. He was the owner of the house we could only see from a distance a few weeks before. He had decided to sell the house at last. Another rendezvous at a crossroads and a short drive to the beginning of the private road that led to the house. The house was set out on a peninsular. The view was magnificent, easily sixty kilometers of countryside in any direction. Highlights were a parasol pine tree at the start of the drive and a circle of plain trees in the courtyard in front of the house. Mr Bruso's father lived there alone and was sick. Sadly, his obsession is collecting stuff from rubbish tips, so the whole house and it's surroundings were full of junk. There were 6 hectares of land including a wood and the roof was still good. Caroline fell in love with it straight away and we decided that this was the one. We were invited for an aperitif and as we left, Mr Bruso told us that he was thinking of selling for 2,5million french francs (± €350,000). Gulp! He will get back to us in two weeks time once he has spoken to his sister, who also may sell her land (4 hectares) at the beginning of the drive. It is expensive, but we can always make a bid at a price we think sensible. For some supersticious reason, I didn't take any photos. Let's just wait and see. That afternoon, we met Marco and Marike, who's house we liked so much, but found too small. They have sold it! They had seen a house that they thought would suit us, and visa versa. We took them to the house on the hill in Auriébat and they showed us, from afar, a house near St Justin that we had already visited a few weeks before. They had heard that the owner was about to sell. It is owned by an elderly, single man and his ancient mother. They let turkeys and chickens run loose in the house and it has never been cleaned. Max and Addie had taken us there to say hello, but he said he wasn't selling. Maybe he has changed his mind. Time to call Max! Marco cooked us an excellent dinner of home-grown duck and we drove home through the mist coming off the still warm tarmac, trying to avoid the hundreds of frogs and toads flopping around in the middle of the road.